You may remember my post from a few months ago about the unique and adorable array of home items, gifts and everything in between from UncommonGoods. (These still bring a smile to my face every time I open the cabinet to get a coffee mug!) What you might not know is that they also have a ton of jewelry, much of which is handmade and customizable! 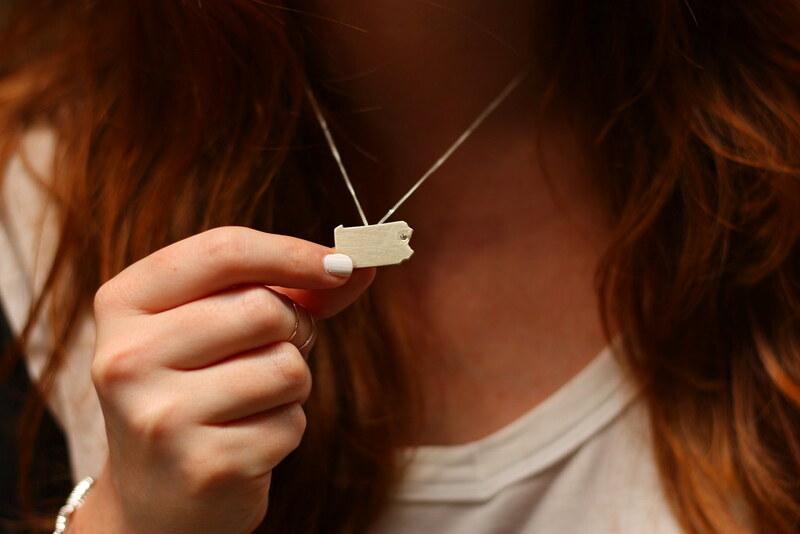 It didn't take me long to decide that these personalized state necklaces were my favorite. I chose Pennsylvania, naturally, and love that I can keep a little piece of home with me and close to my heart when I wear it. And see that little diamond chip? It's placed in the exact location of my hometown, which makes it that much more special and sentimental! If you're looking for a great gift for a friend or family member (they have men's jewelry, too -- including cufflinks!) or maybe just want to treat yo-self to something (go ahead, you deserve it! ), I'd definitely encourage you to check them out! I love this outfit - and I was just thinking the other day that I want a PA necklace like that! I miss home so much and it'd be great to have! LOVE that top paired with the floral pants!! So chic! that tshirt is amazing and I love that the diamond is in the place of your hometown, that'd definitely be such a good gift!! I have a similar necklace that highlights my college town and it's by far one of my faves. Love these pants and entire look! That might be the perfect necklace. I love when jewelry makes you smile, not just because it's pretty, but because it holds meaning for you.